Two of our Revolution athletes, Charlie Radencich and Maya Zonneveld, participated in their first international competition. The two athletes traveled to France to compete at the ‘22e Tournoi International de Combs-la-ville’. This competition was host to International Junior competitors from 10 countries. Charlie had an excellent competition, competing new Junior level routines for the first time this season. Maya qualified to floor and vault finals, and there earned a fourth place on floor, and a silver medal on vault. Congratulations to Maya Zonneveld for being named to the Canadian National Team as part of the Youth National Team. We are excited for Maya's future endeavors with the National Team, representing Canada. Revolution Gymnasts in the News! 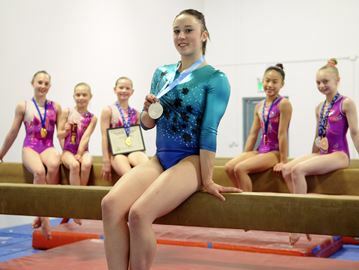 ​Three athletes from Revolution Gymnastics — Maya Zonneveld, Charlise Radencich and Annie Clarmo — have a lot to be proud of after the 2018 Canadian Artistic Gymnastics Championships, held from May 24-27 at the Waterloo Memorial Recreation Complex. Revolution Gymnastics was opened by Aaron and Angela Brokenshire in 2004. Both of them were national level gymnasts and professional coaches. When it first opened, Angela Brokenshire said they were more focused on recreational introductory level classes, but as the community became more interested in their programming, they ended up selecting athletes to move from the recreational program to a more competitive program. In 2010, the gym relocated to its present location and has about 750 athletes in the recreational program and about 150 in the competitive program. Zonneveld, 13, competed in the high-performance novice category and was crowned the floor champion, obtained a bronze medal on vault and a silver medal in the all-around competition. According to Aaron Brokenshire, she is the second-best gymnast in the country under 13 years-old. She started gymnastics when she was just 18-months-old at the Cambridge Kips Gymnastics Club and said what she loves most about the sport is the satisfaction she feels after doing a really good routine. She said her results at nationals made her feel really happy. "I was still shocked and surprised because I didn't think I did that well," said Zonneveld. She said she loves attending the gym because of how supportive everyone is and because her coaches — the Brokenshires and Sarah Fischer — have good techniques and say the right things in order to make her gymnastics better. Radencich, 14, competed in the JO Level 10 (age 12-15) category and represented Team Ontario in her first nationals appearance. She had a sixth-place finish on uneven bars and beam, and took seventh place on vault and the all-around competition. She said what keeps her successful is setting goals for herself. "I set goals and then I try to get there," said Radencich. "I like to work hard because I feel accomplished when I do." Radencich started when she was 17-months-old at Guelph Saultos Gymnastics and came to Revolution when she was 12. "I came here because the other club was focusing more on the recreational program so I wasn't going to be able to get to where I want to go," said Radencich. She said she wants to pursue the sport for a long time and wants to obtain an athletic scholarship to a university in the United States. In fact, this is the goal of all three of these athletes, as they look up to the four gymnasts who trained at their gym — Stefanie Merkle, Casey Carvalho, Sydney Townsend and Kristen Peterman who received athletic scholarships to various universities in the U.S. According to Angela Brokenshire, Peterman came back from college to help the girls out at nationals, which meant a lot to them. "She kept them calm and told them 'hey I have been here before and you guys are doing great,'" said Angela Brokenshire. Clarmo, 14, started when she was 18-months-old at Base Borden Gymnastics Club in Borden, Ont., and came to Revolution when she was around ten. Along with Radencich, she also competed in the JO Level 10 category and represented Team Ontario. She came eighth place on vault and 13th in the all-around competition. This weekend our Revolution athletes were simply spectacular as they competed against the best in the country at this years National Championships. 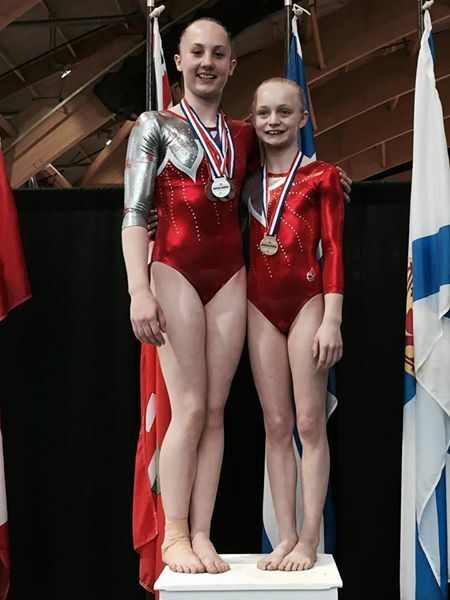 Annie Clarmo and Charlie Radencich represented team Ontario in the JO 10 category. Both Annie and Charlie helped their team earn the silver medal with consistent and solid performances. Both girls qualified for day 2 finals and continued with their successful performances in the individual competition. Charlie finished 6th on beam and bars and placed 7th on vault and all around in her very first National appearance. Way to go Charlie! Annie hit 8/8 routines over 2 days and finished 8th on vault with a beautiful stuck landing and placed 13th AA. Well done Annie! Congratulations to Maya, Charlie and Annie and coaches Aaron, Ange and Sarah on an outstanding year! What a great way to end the season. And now on to summer training. We can't wait to see what next season brings! Day one at the Ontario Championships in Windsor was a success for our athletes. In the HP Novice category, Maya Zonneveld was crowned Provincial Champion! Maya had a fantastic day and also earned a bronze medal on bars, silver medal on beam and gold on the vault and floor. Outstanding performance Maya! In the Aspire 1 category, Melania Leschuk earned a bronze medal on the floor and finished 9th all around! Way to go Melania! 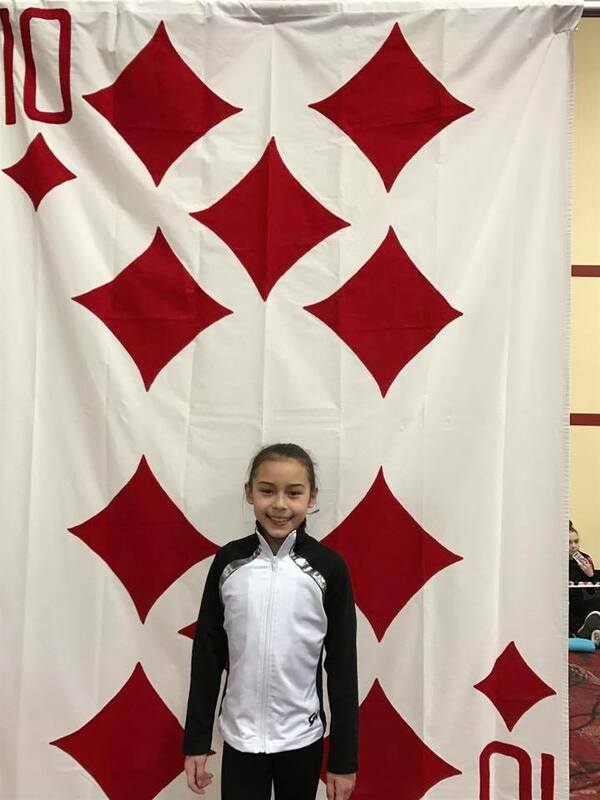 In the level 8 age 14 category, Zarah Zennedine hit all 4 events and finished 14th AA in a super tight field that saw the top 15 kids seperated by just over a point! Great meet Zarah! In the level 10 under 15 category, Charlie Radencich had an impressive performance and came away with the bronze medal overall. She also earned a silver medal on the bars and was crowed the provincial vault champion! In the level 9 age 11-13 category Ava Belsher had the her best meet of the year and came away with the bronze medal on beam. Ava also finished 8th overall which earned her a spot to represent team Ontario at the eastern Canadian championships in May. Katie Popplewell also competed in this category and earned the silver medal on vault. Well done girls! We are also sending a big shout out and congratulations to Kira Costen who competed in the Level 8 age 11-12 category, Jaden Gomes who competed in the Level 6 age 14 category, Isaiah Pereira who competed in the Level 2 age 10-11 men's division and Isaiah Deering who competed in the Level 3 age 13-17 men's division. The last day of competition closed with our level 1 boys team finshining strong. In the Age 12-13 category Julien Roy had an impressive showing earning 6th on floor and 5th on pommels. He also was 4th in the AA and earned the bronze medal on rings, 2nd on high bar and came away with the gold medal on vault. Nicholas Satchell placed 5th overall and had 5th place finishes on rings and p-bars and a 4th place finish on floor. He also took home the bronze medal on vault and pommels and the silver medal on high bar. Congratulations also go to Keagan Bernard, Evan Daikin, Gage Von Cromvoirt and Jack Kinsey who competed in the age 9 category and Caden Schmidt, Dominic Feltmate who competed in the age 8 category. Congratulations to Maya Zonneveld for competing at this week's Elite Canada in Quebec City. After a 2-day competition, Maya earned Bronze on vault, and 7th all around in the HP Novice category. Winning weekend for Maya Zonneveld & Annie Clarmo who brought home GOLD All- Around in their respected categories. Maya Zonneveld ( HP Novice) - Brought home gold medals on vault, floor and all around, along with a silver medal on the beam and a bronze medal on bars. Annie Clarmo (Level 10 Ages 12-15) - Won a gold medal on Floor and All - Around. She also won a bronze medal on bars and a silver medal on the beam. Teammate Charlise Radencich earned a gold medal on the vault & bars, and a bronze on floor and in the all-around. In the level 8 (age 11-12 category) Kira Costen earned a gold medal on bars and finished 8th on beam. In the Level 8 (age 13 category) Zahra Zeineddine earned a silver medal on both vault and bars and finished 5th All- Around. 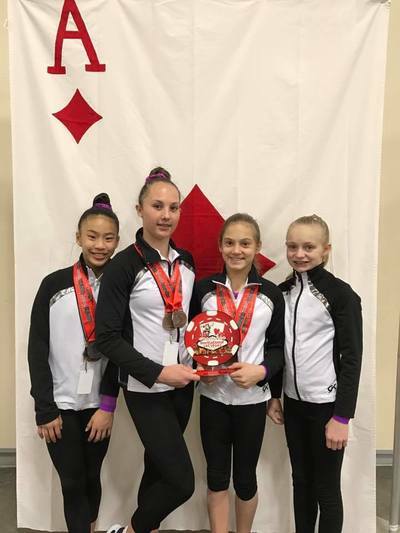 In the Level 9 (age12-13 category) Sparrow Stevens brought home gold on beam, teammate Katie Popplewell earned a silver medal on vault, and finished 6th on the floor. Ava Belsher finished 6th on floor & 6th on beam! In the Aspire 1 Category Melania Leschuk won a gold medal on floor, and brought home a bronze medal on both the bars and All- Around. What a great start to the 2017/2018 competitive season! Congratulations to Maya Zonneveld for finishing 10th at Day 2 of the HP Novice competition and earning 6th place on Vault and 7th on Floor! Looking forward to one more year of HP Novice! Charlie the Champ!! Eastern Canadian Bar Champ, Bronze Floor, Bronze AA!! Way to go Charlie! Amazing Ava!! Eastern Canadian Bar Champion, Silver AA, Team Ontario Gold!! We are so proud of all the girls that have competed this weekend at "Spring Fling" and are wishing the best of luck to those that compete today and tomorrow!! 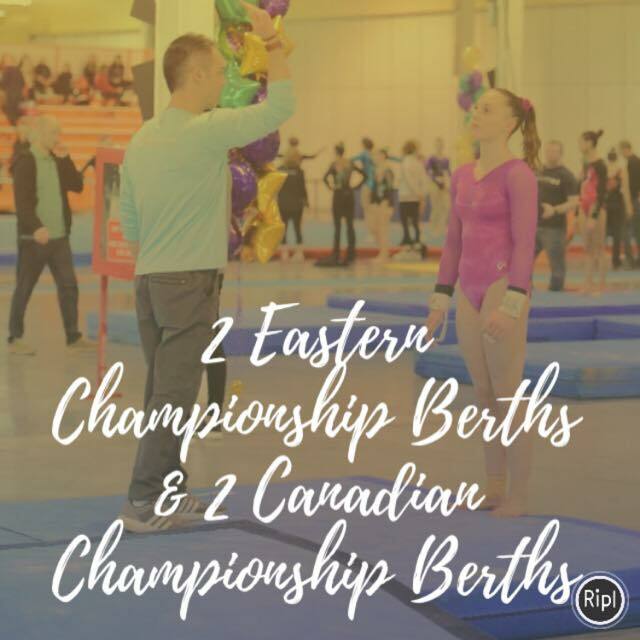 Congratulations to our two athletes who qualified to Eastern Canadian Championships May 5-8th in Moncton, New Brunswick and to our two athletes who qualified to Canadian Championships May 24-28 in Montreal, Quebec. Annie Clarmo will compete at Canadian Championships on the Level 10 Team Ontario, and Maya Zonneveld will compete HP Novice. Also congratulations to Annie for qualifying to Bars finals and Ontario Championships! Charlise Radencich was successful in gaining a spot on the Level 10 Team Ontario for Eastern Championships, and Ava Belscher will compete on Team Ontario at Level 8. "For the Love of Gymnastics"
Fun Weekend at 'For the Love of Gymnastics' competition. Congratulations to all of our athletes!! 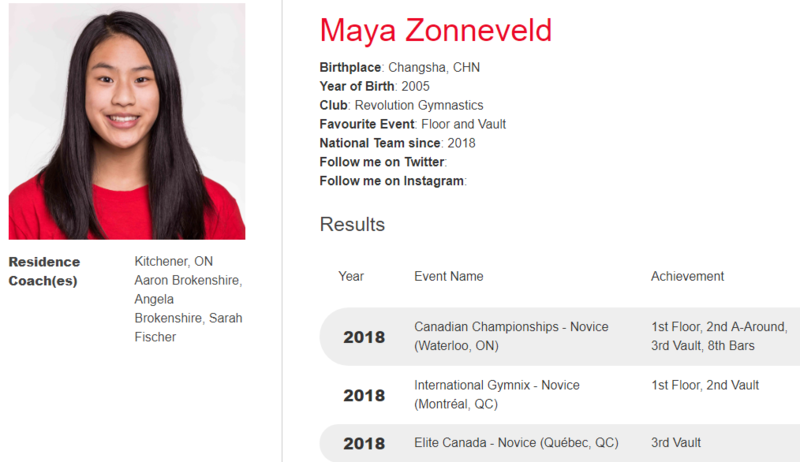 Congratulations to Maya Zonneveld for having a successful first time at Elite Canada!! Maya competed against the best kids in the country for her age and earned a spot on the Novice High Performance List and a trip to Montreal to compete at National Championships in May. Way to go Maya we are really proud of you!! Team Bonding in Las Vegas! Great show! Level 6, 7, 8 and 10s had a blast in Las Vegas at the Lady Luck Invitationals. Starting the 2016/2017 SEASON Strong! Great weekend for the Elite/ Travel team at their first provincial qualifier hosted by Burlington Gymnastics!! Multiple medals were won and fun was had! 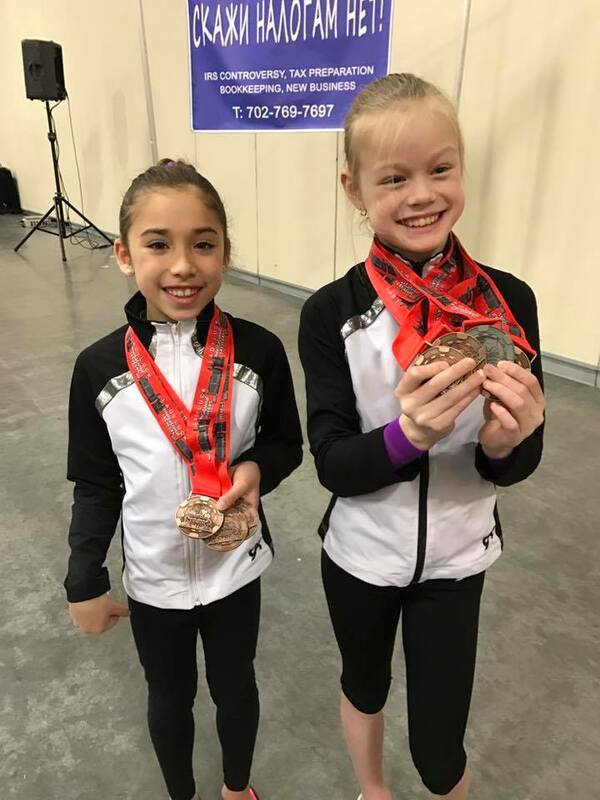 Melania Leschuk competed as a Level 6, 9 year old earned a bronze medal on bars and beam, followed by a gold medal on Floor and finished with a silver medal All Around. Natasha Zaborski competed as a Level 6, 10 year old and earned 8th on bars and beam and 6th on floor. ​In the Aspire 1 Category Sarah Habsch earned a bronze medal on vault and a silver medal on floor. Teammate Petra Neumann won a gold medal on vault and a bronze medal on bars and floor finishing 5th All Around. ​Ava Belsher was victorious on bars earning a gold meal and finished with a Silver medal All Around. Kira Costen competed as a Level 7, 11 year old where she finished 5th on Bars and earned a bronze medal on the beam. In the Level 8 Categories, Zahra Zeindeinne won a bronze medal on the vault and finished 7th on floor in the 13 year old category. Sparrow Stevens competed as a 12 year old, and was victorious on the beam earning a gold medal and finished 4th All Around. Charlise Radencich competed as a Level 10 finishing 4th on Vault and Beam, she won a silver medal on Floor and finished 4th All Around. 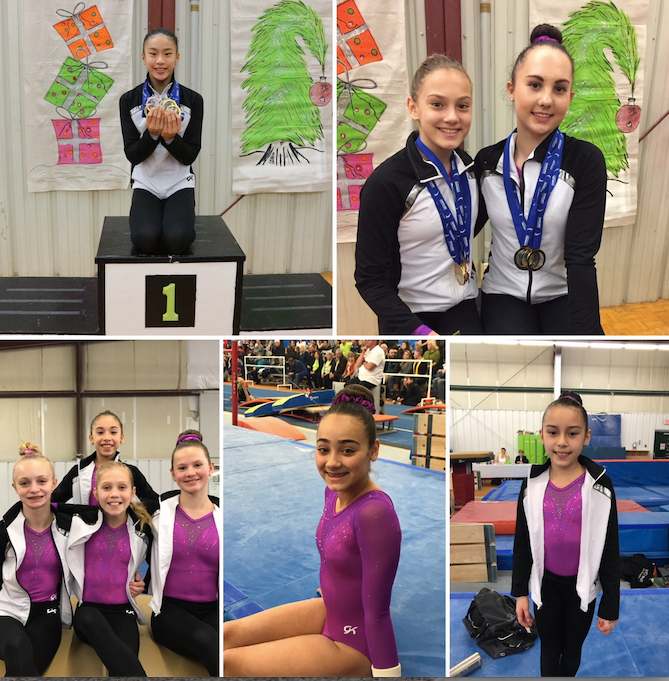 Teammate Annie Clarmo also competed as a Level 10 finishing with three bronze medals on the Vault, Beam and floor, she also came home with a gold medal on bars and a silver All Around. Maya Zonneveld competed in her first National Meet where she finished with a bronze medal on Vault, Bars, Beam and Floor and finished 4th All Around. With Maya's successful performance she has qualified to Elite Canada in February where she will be travelling to Halifax to compete. We are so proud of you all!! Kirsten turned in an amazing performance this week in Gatineau! She finished 7th AA on day 1 and 5th AA on day 2. She also earned her highest all around score to date with a 54.500. With her poised, confident and consistent performance she once again showed why she is among the top gymnasts in the country. KP you have once again made us truly proud. Today Gymnastics Canada named 3 athletes to the Olympic team and will now deliberate to select the final 2 team spots and official alternates. The official announcement of the full women's team will be made Thursday. 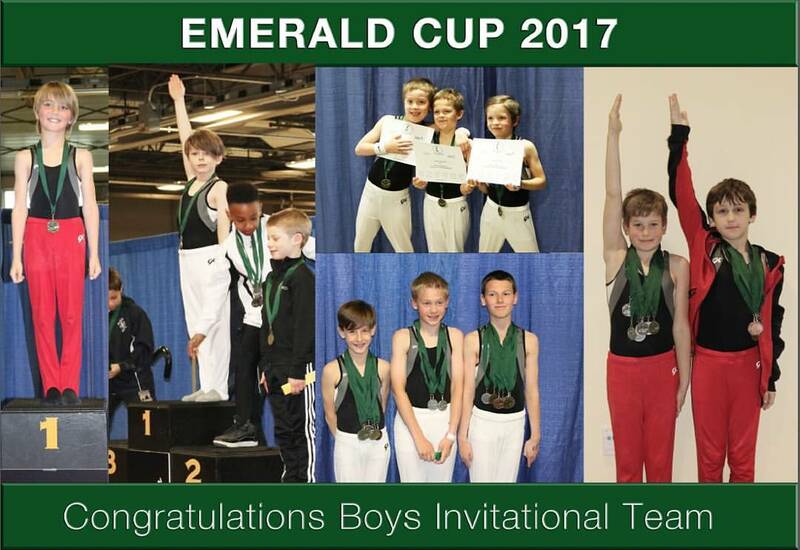 We want to congratulate Kirsten, Aaron and Ange and all the amazing gymnasts and their coaches who competed this week for their outstanding performances. Good luck all! 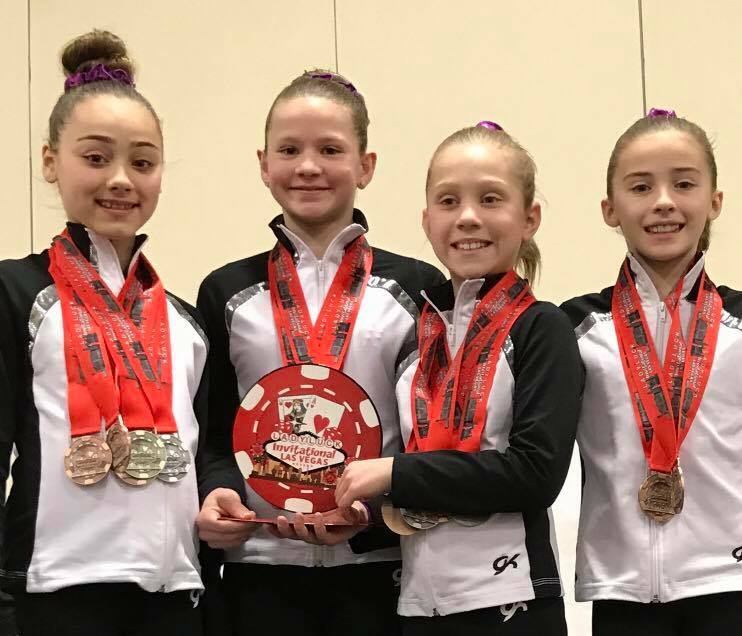 REVOLUTION GYMNASTS ARE GOLDEN AT EASTERN CANDIAN CHAMPIONSHIPS! 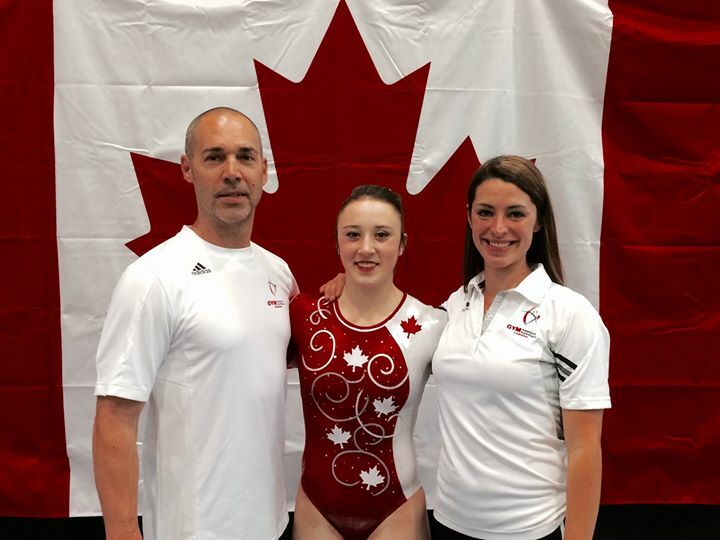 In the level 9 category, Annie Clarmo was crowned the Eastern Canadian vault champion this weekend. Annie also took the silver medal on bars and placed 3rd in the all around competition. Annie's strong showing also helped the level 9 team take gold in the team competition. Way to rock it Annie! In the Aspire 2 category, Katie Popplewell had a strong and consistent performance and took 5th in the all around in her very first Easterns. Katie also helped the Ontario Aspire 2 team earn gold in the team competition. Awesome job Katie! It's been a busy news week for our Revolution athletes!